Toronto – June 22, 2016 – Reconciliation within a workplace environment is about inclusion, belonging, dignity and respect. Throughout National Aboriginal History Month, we have been exploring the four pillars of the Touchstones of Hope model, led by The Caring Society (FNCFCS) and have adapted it to reconciliation in the workplace. 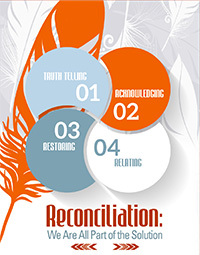 The third pillar of reconciliation involves restoring. In reconciliation, the pillar of restoration is about each person's responsibility to redress the challenges that exist in the workplace. It can only occur when workplaces and work environments are open to change. Living and working within the reconciliation framework means committing to workplace equality and sharing with others what actions you see as important components to build workplace solidarity. Supporting culturally-based equity initiatives including Shannen's Dream, Jordan's Principle and I am a Witness campaigns, all aimed at increasing equitable access to services for First Nations children in Canada (Principle - Structural Intervention). Non-indigenous workers must understand the importance for self-determination for indigenous peoples in the context of Canadian history (Principle - Self-Determination).